Geriatric Care Management Technology -Experts?? Laurie Orlov is an expert in aging technology. She was once my student when she got a degree in geriatric care management at the University of Florida. She is an advocate of the best technology being used in the field’s and for aging in general.. Check out her blogto learn how to integrate the best technology into your geriatric care management business and the best not so best aging technology in general. .
Ms. Hemingway had caregiver stress and burnout from caring for her aging live-in partner Mr. Jefferson days a week with no respite. 1) The GCM Miss Fullcharge will visit weekly for 3 months on a day Sally does not have respite to talk with her and to assess whether Sally’s caregiver burnout and stress is improving. 3) Miss Fullcharge will talk to Mr. Jefferson, privately, on each visit to make sure he is satisfied with the care provider and all his needs are met while he allows Sally respite. 5) Ms. Fullcharge will phone the supervisor at Good Care private duty home care agency each week or as problems arise Mr. Jefferson ‘s care provider either improves the care or is replaced. How are these goals measurable? You should have a Care Monitoring Report that you complete each time you visit. The results can be summed up in a monthly report to the client, weekly e-mail to the client or by submitting a copy of the reports if requested. Your own charting and reports should show over times that Sally’s caregiver stress is reduced and Mr. Jefferson remains comfortable with this arrangement. If not you will have to create new interventions. So this is how you have one care plan goal and measure it. Where do you get the interventions or solutions for the problems listed in your care plan? In part, you take them from the continuum of care. What is the continuum of care? It is all the resources for aging adults in your services area. The continuum of care ranges from hospital discharge planners, doctors, elder law attorneys, trust officers, to plumbers, licensed contractors, private duty home health agencies, moving specialists, senior technology teachers, caregiver support groups. 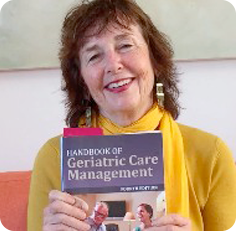 It is the body of knowledge of resources you know as a geriatric care manager or aging professional to fix the problems you have just outlined in your care problems. Every geriatric care manager or aging professional must know a staggering array of other experts who make up the web of senior services in the community. These experts practice in areas to which GCM skills do not extend (attorneys, trust officers, moving companies, plumbers). It is the care manager’s expert knowledge of the continuum of care in the community that is the heart of the care management role. As stated I have blogged before, a Geriatric care manager or aging professional is like Charlotte, the friendly spider. The GCM runs across the web of senior services (continuum of care), linking services, repairing gaps, spinning new solutions, and coordinating answers. You need to know how to locate all those services to implement your care plan and find interventions to the problems you have uncovered. How do you combine care plans from multiple assessments? First let’s look at what is a care plan. After the initial assessment information is gathered from multiple assessments, a comprehensive list of the client’s problems and interventions should be generated. This list is called a care plan. A care plan is a strategy to repair the holes in your clients’ web or safety net. Your client is experiencing problems because the web of support or his or her own functioning has deficits or holes. The care plan suggests a way to repair those holes by recommending the right services at the right time for the right amount of money. As I have mentioned many times, you are Charlotte, the crafty spider from Charlotte’s Web, using the large continuum of care in your community to recommend ways to repair holes in the older person’s personal web. But Charlotte is spinning multiple threads, much like the Internet. More about basic care plans next blog. Can A Larger Agency Adapt to Caregiver Assessments? There are not on only ethical issues to be solved about a caregiver assessment but a management issue. The caregiver assessment concept brings care managers back to an age-old question. Just who is my client? Is the care receiver your client or is the caregiver your client? For care managers and all professional in aging to see the caregiver, as a client is a major challenge. The focus as care managers and aging professionals has always been on the care recipient as the client. The National Center for Caregiving suggests that the professional in any agency to see both the caregiver and care receiver as client, a shift must take place in the entire agency. Both administration and front line care managers need to build a consensus that the caregiver is a client as well. If a geriatric care manager practice is in a solo practice, there are few problems.However in larger agencies like non –profits, area agencies on aging ,for profit agencies like home health or private duty home care, the administration must create a consensus that will include the caregiver as a client so that front line care managers get the necessary support. Questions like, will the care givers have their own records and what will be the budgetary impacts and pressure on staff to be inclusive, will have to be answered. Concerns may come up with other staff like more paperwork, taking time away from the care receiver, lack of resources in the community to meet the caregiver and the caregiver’s reluctance to share the information.